"Welcome to the surface of Epsilon Prime." 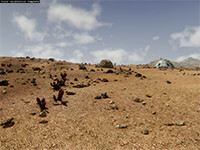 From February 17, 2014 until December 1, 2018, this site hosted an unusual game called Extrasolar that was unlike anything before it. 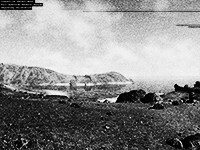 Inspired by Alternate Reality Games (ARGs), it used videos, cloud-rendered imagery, email, terminal systems, phone calls, PDF files, and a collection of website to tell a story that was half about exploring an alien planet and half about playing a pivotal role in a drama that's unfolding back on Earth. Despite a cult following, the game was never self-sustaining. Running the cloud services cost me about $900/month. Eventually, it just didn't make sense to keep the servers running. 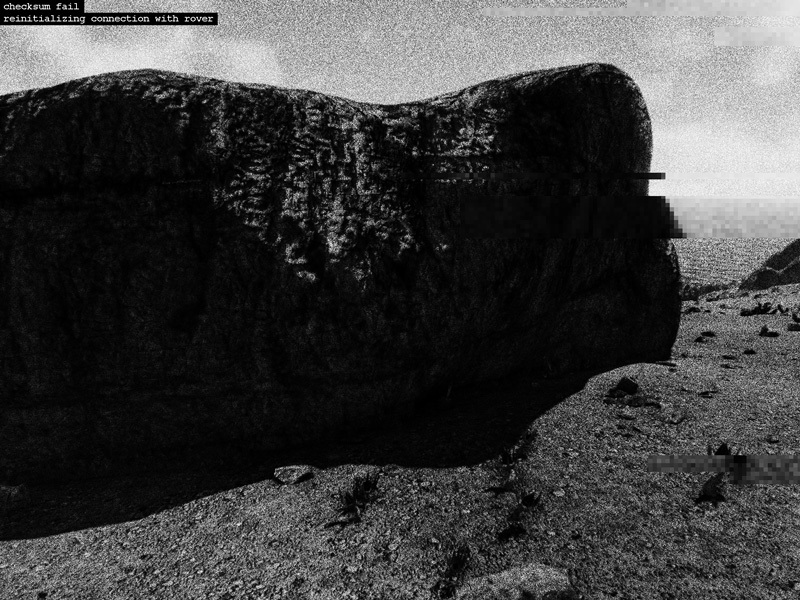 One of the challenges with this type of unusal game is that once it's gone, it's hard for other developers to study it. It's also a shame when a great story disappears from the world. In this archive, for the benefit of fans and game developers, I'll recount the story as it once existed. 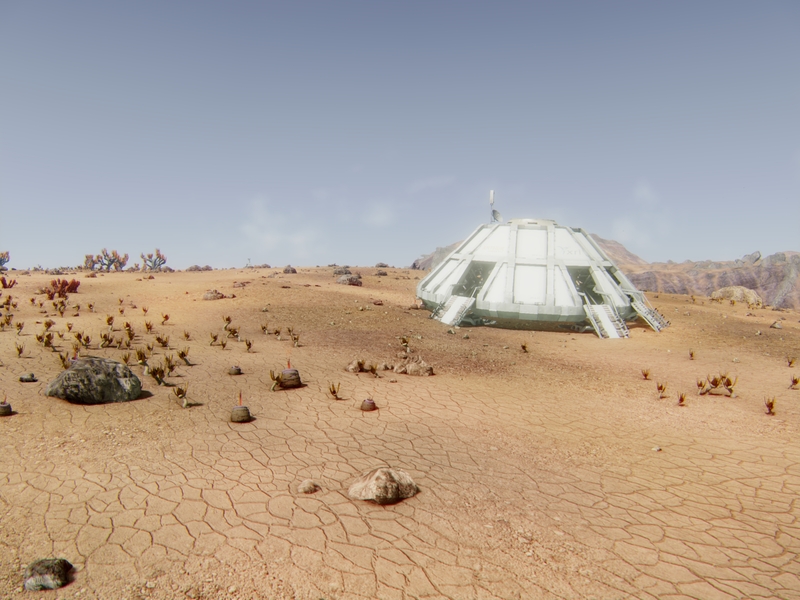 To learn more about why I eventually shut down the game, check out the official postmortem. For players who would like to share memories from the game, feel free to visit our forums. There were a few ways you might learn about Extrasolar. 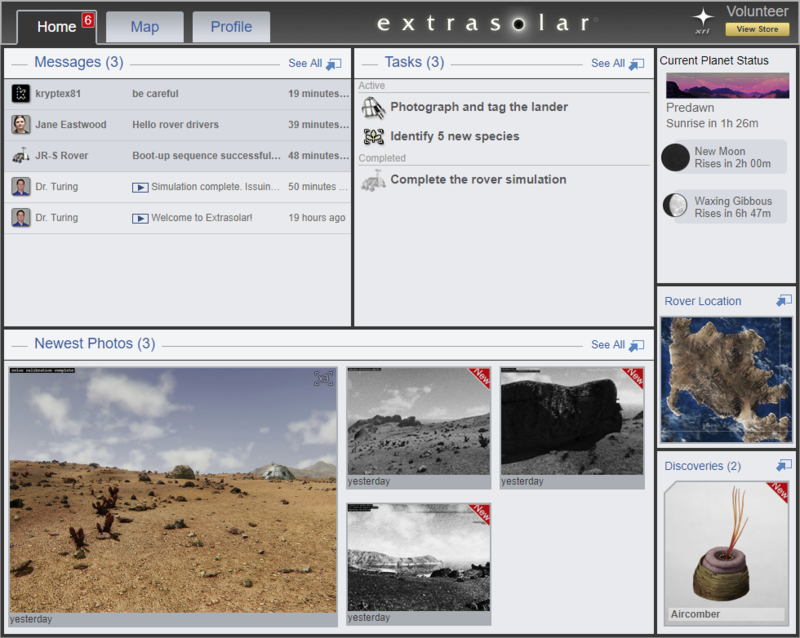 Some websites, like WhatIsExtrasolar.com gave a glimpse behind the fourth wall, explaining that Extrasolar is, in fact, a game. But most rabbit holes, including invitations from friends or the website for the Exoplanetary Research Institute (XRI), stayed within the fiction of the universe. Here's an example video where you might learn about the Extrasolar program. The surprises begin as soon as I sign up. When I create an account, I'm told that all of the rovers have already been allocated. Moments later, a terminal pops up in front of the message. One line at a time, messages appear -- someone is reaching out to me! > please don't close the window. > it's a one-way messaging script, so don't bother trying to reply. > i go by kryptex81. > but who i am isn't important. > i don't trust the extrasolar program. > lots of history there. > let's just say i have good reason to look a little deeper. > i have access to their voicemails and messaging, but their intrusion detection system firewalled me out of the rover control application. > plus, there's no way i could apply with my own identity. > i need a clean account and ip address. > access that looks legitimate. > i give you a backdoor account, get you a rover. > you become my eyes and ears on the inside. > i set up a backdoor link to get you rolling. > a dummy account with an aced entrance test and signed nda. > there are piles of rejected applicants to choose from. When I click the provided link, as promised, my account gets unlocked. 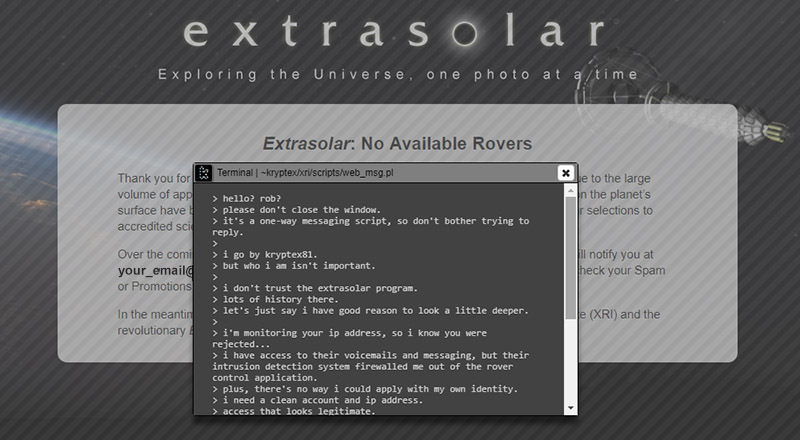 Waiting in my Extrasolar inbox is a welcome message from one of the program organizers, Dr. Robert Turing. 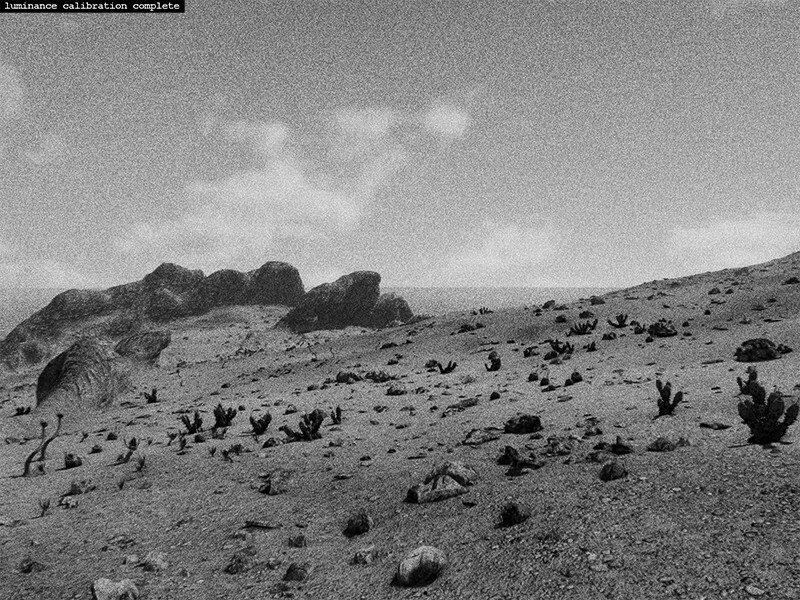 Subject : Welcome to Extrasolar! Welcome to the Future of Space Exploration! After viewing the welcome video, you may continue with the rover simulation by clicking the Map tab at the top of the screen. 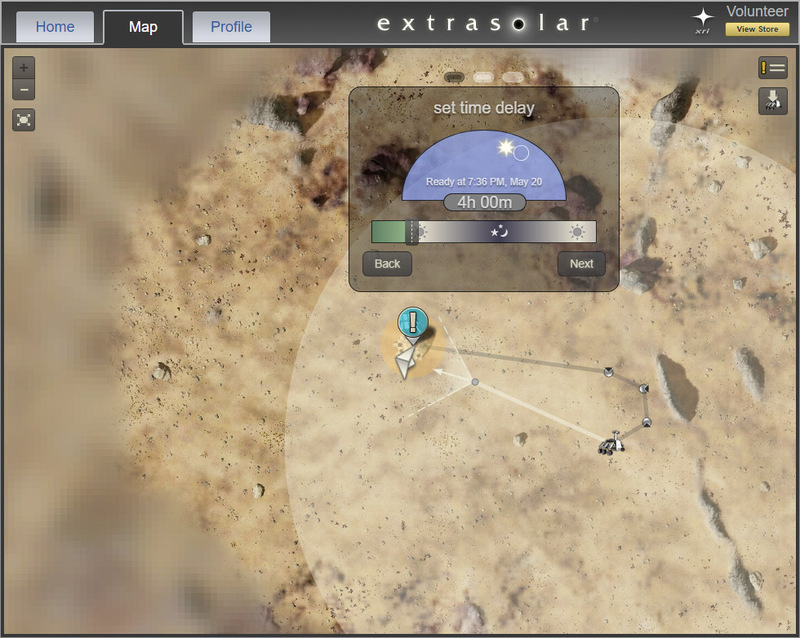 During a brief tutorial, I'm shown how to use my map to drive my rover to a new location and schedule a photo. I'm also shown how to tag portions of my photos in order to identify areas of interest for the science team. With the simulation training complete, I'm officially issued a rover. Subject : Simulation complete. Issuing rover. There are four new images waiting for me in my gallery. As explained in the video, my rover was instructed to take these photos as part of its wake-up and calibration process. Meanwhile, the user interface I use to monitor my messages, tasks, gallery, and discoveries is starting to fill up with more requests. In the right column of this page, I can monitor real-time data for the moon phases and time of day on Epsilon Prime. Withinn an hour, there are three new messages from XRI and the mysterious hacker who got me in the back door of the program. The JR-S rover is the standard low-cost robotic platform developed by XRI for the exploration of extrasolar planets. The JR-S can rotate its camera to produce a 360° view of an area. Transmitting panorama data to Earth requires a high bandwidth load and is limited for Volunteer level users. To lift this restriction, consider becoming an XRI supporter. I'm Jane Eastwood, lead exobiologist for the Extrasolar project. It is a great opportunity to be the first to catalogue and study life on another planet. As we posted on the XRI website, early readings and images confirmed our suspicions that Epsilon Prime supports life. Seeing the first pictures we got back from rovers was an incredible experience. Now we'll learn what we can about these organisms: Do they follow the same principles as life on Earth? How do they survive? How have they evolved--and do the same tenets of evolution hold? Our science team controls a specialized science rover with tools for many biological tests. Part of your job while you explore for Dr. Turing is to scout for us--based on the organisms you tag, we'll know where to find new specimens and good test subjects. To begin, simply identify some unique species in the area around the lander. This will give us a good introduction to the species of the island. Tag as many organisms as you can--the more samples we have, the more accurate our work will be. Thanks, and I look forward to seeing what we discover. i guess i should thank you for agreeing to help me. they're not telling you everything. i'll stay in touch with you through xri's messaging and task systems. for now, just do whatever they ask to avoid raising suspicions. you can't afford to screw up. Following the instructions from the XRI team, I schedule a photograph of the lander. 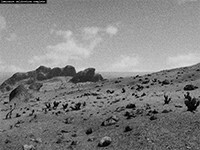 Everything takes place in real-time, so when I schedule a photo for 4 hours from now, it takes 4 hours (or 1 hour for paying members) for my rover to move to that location, snap a photo, and send it back to Earth. When I arrive at my lander, this is what I see.